The inside of this house could use a freshening with paint. When I was in New Orleans visiting friends (who sent me a plane ticket so I had absolutely no excuse for not getting away), I saw porch ceilings painted a light blue, not baby blue, but the color of water, a silvery blue. The color choice had something to do with keeping mosquitoes or wasps or some insect away, and I don’t know if that works, but I’m thinking of painting all the ceilings in this house with that color instead of ceiling white. Imagine looking up inside and seeing the color of a light sky. As I’m going room-to-room and cleaning out things, I’m looking at walls and woodwork that need sprucing up or a color change. Years ago I painted an accent wall in my office a color called terra cotta. I wanted a color I call Oklahoma. It was the color of the sunlight hitting a rocky, yet clay-heavy cliff on the shore of Grand Lake. We were sailing at sunset, and the color was the most wonderful shade I’ve ever seen. It shimmered and sparkled with probably some quart in the rock, and yet the color was golden-reddish something. 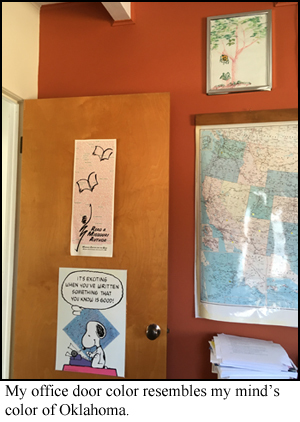 After I painted one accent wall in this office, I realized the color I wanted was the color of the wood in the door. Maybe now I’ll see if a paint manufacturer has perfected that color and repaint the wall. We need color in our life. And we need to look for it, especially in winter. 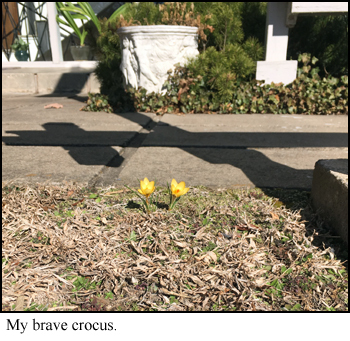 Near the front porch where they get southern sun, courageous yellow crocus bloom, and they’ve been open for over a week—at least I’ve noticed them for a week. Sometimes I’m in too much of a hurry to notice things. Sometimes I listen to a book on my phone on my daily walk instead of listening to the birds and seeing what’s new in nature around me. I need to change that and see this world and look for cheerful color. I should play I Spy alone and not see the blue of a trash cart, but the varying blue shades of the sky. There is green in patches of the grass. We just have to look for it. 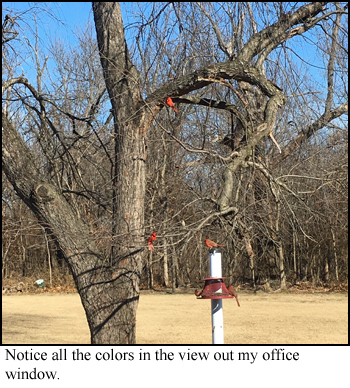 The colors may not jump out at us like the glow of my color of Oklahoma, but they are there. I’m going to brighten my world by looking closely at the natural world around me. You, too?